Strong and abrasion resistant fluorocarbon leader. Equipped with extra strong Prorex swivel and snap, this leader is highly recommended for the use at clear waters when you are fishing with large lures. 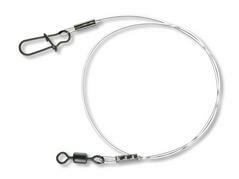 The high linear strength easily withstands the bite of a pike.